It's Too Easy to Create a Lie. Will The Anti-Gidon Sa'ar Letter Writer Be Caught and Punished? Being a public figure isn't easy on one's personal life. Israel's Minister of Education Gidon Sa'ar just got a very painful lesson in that subject. One of his enemies decided to knock him down a few levels and/or boot him out of politics by accusing him of sexual misconduct. It was pretty easy. The person just wrote a letter, signing "initials" and then sent it off so the public could hear about it. After innumerable headlines and articles and tv news time spent on the subject of the "evil Gidon Sa'ar" that the previously squeaky clean Likud politician was just like the others, it has finally been revealed by the police that the letter is a forgery. Now, I wonder if the police will devote the same time and energy to investigate, discover and prosecute the forger/forgers? People should know that if they try to destroy a person and his/her career that they will be destroyed instead. There's so much internal fighting and intrigue in high places, whether politics, academia, finance, media and more. It's really frightening to think how easy it is for someone to just write one of these "letters" or notes which can totally destroy a person, his/her family, reputation, career and worse. I really hope that the Israeli Police won't rest until they discover, try and convict the guilty in this real scandal. A subgroup of Al Aksa Martyrs Brigade, the military wing of the Palestinians’ Fatah faction, said it fired the rocket in response to what it called the “assassination” of Arafat Jaradat, the prisoner who died on Saturday. Palestinian leaders have placed blame for Mr. Jaradat’s death on what they described as “severe torture” during interrogation, though Israeli officials say the bruising and broken ribs cited as evidence of torture could have been caused by resuscitation efforts. It's a very lame excuse as excuses go to resume the terror attacks on Israel, not that the terrorists need excuses. I have no doubt that they have been efficiently planning this attack and more to come ever since they had agreed to the ceasefire. They were just waiting for the right excuse to resume bombing Israel. Israel is doing the proper thing and investigating Jaradat's death, but that won't satisfy the Arabs and the "world" because they don't want to accept that Israel is blameless. Israeli officials dismissed on Tuesday a Palestinian Authority demand for an international inquiry into the death of Palestinian detainee Arafat Jaradat as a “predictable” maneuver and part of a larger strategy to bring the international community into the conflict whenever possible. A call for international involvement is “nothing new,” one official said, and is part of the overall Palestinian strategy. It's necessary for Israel to take the high road and blame the Arab terrorists and the international bodies and western world for supporting and understanding them. We and they should just understand the truth. The truth is that the ultimate aim of the Arabs, and a good part of the international community is that the world would be better off without Israel. This is nothing new. This is why during World War Two when the millions of European Jews were being systematically murdered by the Nazis the rest of the world stood passively silent. The war against the Nazis was to keep them from taking over all of Europe and Great Britain. Destroying the Death Camps was not in the battle plan. Great Britain had the Mandate to occupy the HolyLand and prepare it to be the site of the Jewish State, but they did everything in their power to keep that from happening. They minimized the immigration of Jews, even those Jews escaping the Holocaust and they supported the Arabs over the Jews. Israel shouldn't listen to foreign complaints and advice. Our responsibility is to destroy the Arab terrorists who aim to destroy us. There's a phenomena I've noticed in both Israeli Knesset Elections and in our local elections for the Mazkirut, (sort of town council) here in Shiloh. The less known the candidate the more votes he or she gets. I guess it's because those people haven't yet made enemies and their weaknesses are still unknown. In the forty plus years I've been living in Israel, I've seen so many political parties and "leaders" come and go. Naftali Bennett is a wealthy man, having made his fortune by selling an innovative high tech company, the dream of many. Many people had hoped that he'd be the dati le'umi (national religious) version of Jerusalem's very competent and successful Nir Barkat. But Bennett has been increasingly disappointing his voters. Arutz 7 has an op-ed/blog by Rabbi Lazer Brody that expresses the disappointment many of Bennett's voters feel. As my regular readers know well, I'm not an NRP-aka Bayit Yehudi voter and never was. The main reason is that I don't think a political parties should be rooted, labeled as religious or secular. I prefer an inclusively Israeli-Jewish political party that recognizes the importance and centrality of Judaism to the State of Israel. The stodgy old NRP-National Religious Party has been around since before the establishment of the State of Israel. It had been loosing support over the past couple of decades. The NRP has been looking for an attractive marketable head to bring it back to "its former glory." Bennett has been flitting around the Israeli political scene ever since he came back from his great financial success in the USA. It had looked like a good match, and Bennett also seemed to be coated with teflon. He had no big problem wiping away the complaints about himself. His short time with Moetzet YESHA was easy to blame on Moetzet YESHA, and his departure from Prime Minister Binyamin Netanyahu's inner circle was even easier to blame on Sara Netanyahu. Now, the NRP is getting nervous. They should have looked more carefully before signing the Ketuba, marriage contract with Bennett. Who are the two people closest to Bennett? From what I have read, they are Bennett's wife and his long-time sidekick Ayelet Shaked, who joined him as the token secular in the NRP. Both of those women are secular. In the Israeli political/ideological scene that puts them and therefore him in a very different mindset from your NRP-Bnai Akiva circle. PS This isn't lashon haraa, eveil speech. Nothing I've written is secret, and these sorts of observations are permitted when it comes to public figures who are vying for national leadership. Both Biblical feminists (were they.) Esther and Chana (Hannah) had to save the day, more exactly, save the Jewish People! 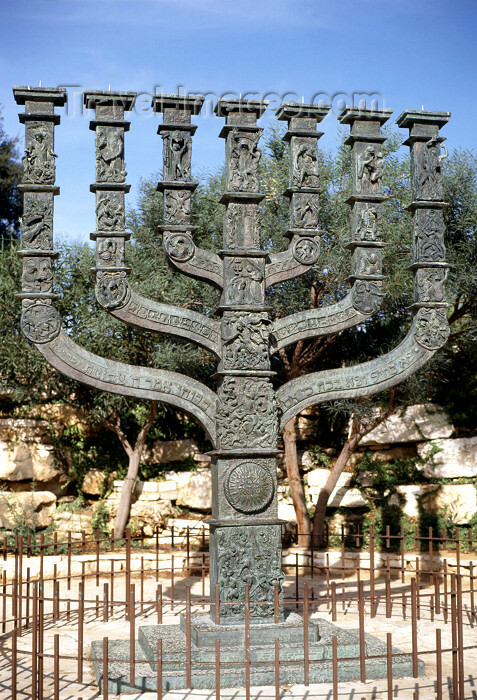 Basically, if you look at a timeline of Jewish History, like this one I found on aish.com you'll see that Chana's prayer at the Mishkan Tabernacle in Shiloh ends the period of Judges, because it is Shmuel (Samuel) the son she had prayed for who anoints the first two Kings, Saul and David. And Esther appears in Persia after Persia conquers the Jewish Kingdoms including Jerusalem and the Holy Temple. We needed Chana to break the cycle of anarchy which had existed from Joshua's death until her son Samuel was entrusted by G-d to anoint Saul as King of the Jewish People. Chana's prayers for a child weren't for her personal maternal fulfillment. Neither he husband Elkanah nor the Kohen HaGadol, Chief Priest Eli understood what she wanted to do. Elkanah advised her to accept her barrenness with joy, since her life wasn't endangered by pregnancies and childbirth, a common killer of women at that time. And Eli HaKohen thought her mode of prayer to be suspicious and unconventional. 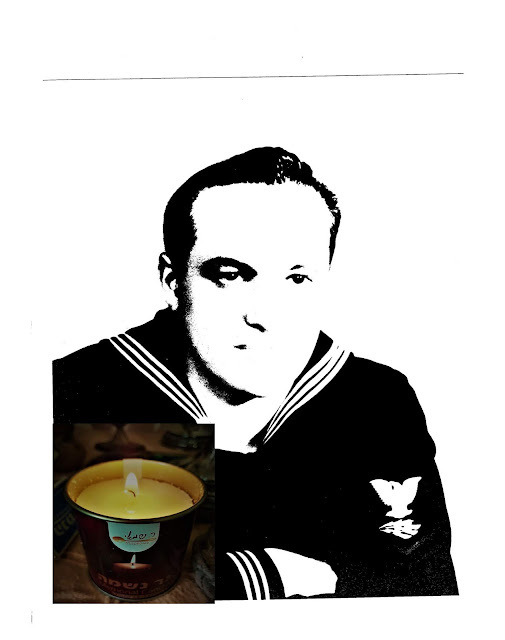 Chana was a trail-blazer, because davka her mode of prayer, silently mouthing the words to G-d who hears what's in our hearts, has been adopted by Chaza"l, our Sages, as the proper way to pray. After her son Shmuel had been weaned she brought him to the Tabernacle in Shiloh to learn Judaism from the Priests, but she made a point of visiting him every year with new clothes and took the opportunity, no doubt, to teach him what she considered his role to be. Centuries later when corruption and sin became much too common among the later kings of both branches of the divided Jewish People, Yehuda and Yisrael, the Jewish People were conquered. The Persian king Achashverosh ruled, and somehow the secretly Jewish Esther aka Hadassa was chosen as his queen. Now wahh would the Jewish People do or how would Jewish History have played out if there hadn't been Jewish women like Chana and Esther? One thing I have no doubt about. These recent Knesset Elections here in Israel have been the elections from Hell for Prime Minister Binyamin Netanyahu. Nothing has gone as planned. His pact with Avigdor Lieberman-Yisrael Beiteinu ended up costing him a comfy plurality. And instead of the usual one surprise strong showing of newcomers, there were two, Yair Lapid-Yesh Atid and Naftali Bennett-NRP aka Bayit Yehudi, who have a combined MK total which matches his Likud-Beitenu one. And even worse, those two newbie party leaders have joined forces against him making outrageous demands. They're making the normally wily Bibi look a stodgy political klutz. While his two hurry up clocks, the legal time limit he has to form a government and United States Presidents Obama's badly timed visit, have been ticking coalition negotiations have been unprecedentedly difficult. Bibi pulled one surprise by getting Tsippi Livni to join him, even though her entire campaign was based on saying she preferred the opposition because Bibi shouldn't be Prime Minister. She had claimed that she would be best, although the public didn't buy her spiel. And now, to make matters worse, there are rumours that super-loser, with a bare minimum vote to get into Knesset, Kadima's Shaul Mofaz may be joining with Lapid and Bennett to make coalition demands. Could that just be a Purim joke? Here in Israel, it's Purim and depending on where, there can be two days of it. Purim jokes are like "April Fool's Day." In the meantime, Bibi's staff is playing Beat the Clock and trying to make deals. If we can believe the headlines, they've decided rather wisely IMHO to speak simultaneously with both Yesh Atid and NRP. Whatever, I just hope it's going to be good for the Jewish People and the State of Israel. This Shabbat, just before Purim we read a few very important lines as Maftir in the synagogue, Deuteronomy Chapter 25 דְּבָרִים. We are not just to "remember Amalek," like we "remember" the Shabbat, lihavidil, to differentiate, we're supposed to always remember what Amalek did to us when we had just left Egypt and felt confused, full of doubt, lacking confidence etc. That's when Amalek attacked. Did any country actually help and support the struggling Jewish State? NO! When we were our physically weakest, the Arabs attacked and the world continued their silence. The same silence they exhibited before and during World War Two when Nazis were first discriminating against and then murdering Jews. There were even countries, such as Great Britain which even helped the Arabs. And standing by is no better than. We must remember that push comes to shove, we, the State of Israel has no real ally. There's no country that would risk anything for us. Yes, it's a Torah requirement, commandment, Mitzvah, to REMEMBER! Shabbat Shalom and Purim Sameach!! To support Latma's work click here. IMRA has posted two polls, not exactly identical but showing a similar trend. The Israeli public is disgusted with the Likud, though it still wants Binyamin Netanyahu as Prime Minister, and it would vote in even larger numbers for Yair Lapid. What's most interesting is that being part of the coalition, having made a deal with Bibi, is not a turn-on for the Israeli voter. The poll shows Tsippi Livni losing support, most probably because the main item on her platform was that she would never make a deal with Netanyahu. And the Knesset Channel Poll information I found does not give the same sort of complete listing. Considering that there is a big difference between the two polls' results, we just have to look for general trends and not details. Yesterday on the TV news I heard one of the commentators mention that unlike NRP aka Bayit Yehudi's Naftali Bennett, Yesh Atid's Yair Lapid has been pretty quiet. Apparently, the public prefers the quiet. His MKs have also kept their mouths well zipped. It certainly heps that the Yesh Atid MKs are all new to Knesset politics and are probably so busy concentrating on learning the ropes, that they may even be grateful for the order. As I've written many times before, this coalition negotiation game is very much like Poker and chess, too. Players must be silent and give absolutely no indications of their hands or plans/tactics. Unfortunately for the State of Israel, Netanyahu has been under pressure to form a government quickly because of United States President Barack Hussein Obama's upcoming visit. He doesn't not want to be caught with an empty pantry. Maybe that's why Obama was so quick to announce a visit even before Bibi could negotiate a new coalition. We shouldn't forget that we're about to celebrate Purim, the holiday which reminds us that G-d works behind the scenes. Purim is supposed to be a joyous holiday. Define it. What's joy? 1- I've never been one to consider loosing control aka getting drunk or high to be enjoyable. And when it comes to Purim drinking, the point of the drinking isn't to be oblivious to the fact that you're making a fool of yourself, embarrassing your loved ones or endangering yourself or others. The Rebbetzin's Husband posted his annual post about Purim and drinking. It combines halacha (Jewish Law) and common sense, a perfect recipe. 2- I also must say that I also don't enjoy watching other people drunkenly "celebrate." That is not my idea of a good time. 3- I really can't follow the reading of the Megillat, Scroll of Ester when there is noise. I don't know if it's my hearing or just an aspect of ADHD. I get easily distracted. And I'm upset by the fact that rabbis don't take that into account when they emphasize the importance of large public readings to "unify" the community. There are lots of ways to celebrate Purim which are acceptable by Jewish Law and aren't in my list of Purim Peeves. 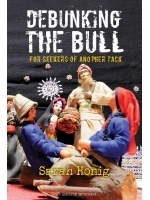 The good news is that you can now buy an entire book of Sarah Honig's articles. Honig's book "Debunking The Bull," Gefen Publishing House, is attractive with very legible font. Honig writes Another Tack, whick is one of my favorite column's in the Jerusalem Post. I'm glad that her articles have now been collected into a book. This is an anthology of Another Tack columns which originally saw light in recent years on the weekend pages of the Jerusalem Post, where they have been a regular weekly feature since 1999. The bad news is that for whatever reason this wonderful selection of Honig's Jerusalem Post articles is lacking the dates these articles appeared. In some cases, you can easily guess the date and/or do an internet search. But if you're already doing an internet search to discover when the article was published, then why buy the book, especially if you go around with one of those new electrical gadgets like smartphones, ipads etc which give you the possibility to read anything online? One reason is that, at least for many of us, we like the feel of a book and don't own one of those gadgets. Or you may be in places and situations where you can't use the electrical equipment, especially internet searches to find all of Honig's articles. And for those who are Shomrei Shabbat, Sabbath observers, the modern electric machinery is forbidden on Shabbat. Of course, as long as you have a computer, or some other way of doing internet searches, you can discover aka search for Honig's articles and their dates. I decided to try a search for one that caught my fancy, "Drenching Little Srulik," which Honig illustrated with a classic Dosh cartoon. Of course I found it, though sans the cartoon. You can read that article on Honig's site/blog, in the Jerusalem Post or on a number of other internet sites. By searching further I even found the missing illustration. Now I'll use that article to illustrate the brilliance of Honig's writing. She took this cartoon, drawn and conceived in 1956 by the amazing Dosh, Israel's greatest political cartoonist and showed its modern relevance in her article written in 2009. And how does this relate to 2009 when Honig wrote the article? And finally Honig brings up former US President Jimmy Carter, comparing him to UN secretary-general Dag Hammarskjold. If you think that only Israel is endangered by the growing Moslem threat, I'll also bring you an excerpt from a different article, A Masjid Grows in Brooklyn, which also appears in Honig's book. She's now a member of a fast-dwindling minority because "people are running away. We're among the last holdouts of our generation. My kids have fled." Pakistani and Bangladeshi groceries lined the main shopping drag, and everywhere stickers boldly beckoned: "Discover Jesus in the Koran." An unremarkable low-slung building on the corner of Kathy's block was now dominated by an oversized green sign identifying it as Masjid Nur al-Islam (the Light of Islam Mosque) and announcing that "only Allah is worthy of worship and Muhammad is his LAST prophet." Here too Christians were urged to "turn to the Koran" if they were "genuinely faithful to Jesus." It wasn't hard to identify the remaining non-Muslim residences. Kathy's was typical. A huge American flag fluttered demonstratively in the manicured front yard, accompanied by a large cross on the door and an assortment of patriotic/jingoistic banners. "We're besieged," she explained. "Making a statement is about all we can do. They aren't delighted to see our flag wave. This is enemy territory." I suggest you read the entire article. As you can see in these excerpts from the book, Sarah Honig is an excellent and compelling writer. 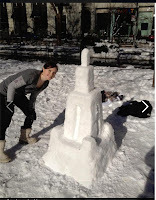 Sarah Honig also has a blog-site. Check it out. Bad news for the State of Israel and its citizens. We've got Tsippi riding shotgun with Bibi at the wheel. Tsippi's special job will be to make peace sic with the Arabs. I kid you not. Israel is extending its hand once more for peace with the Palestinians, Prime Minister Binyamin Netanyahu said Tuesday at a press conference while announcing that former foreign minister Tzipi Livni had joined his coalition and will lead the Israeli peace negotiating team. "I am hoping for a peace deal based on two states for two people, as per the parameters I outlined during my speech at Bar Ilan University," Netanyahu said at the conference. "Today Israel extends its hand once more for peace. We want a peace process, and we hope that it will yield results." Yes, Bibi has finally found himself a coalition partner, Tsippi the Movement Livni, the lady who campaigned as an "alternative" to Prime Minister Binyamin Netanyahu. Yes, the Tsippi who insisted that Netanyahu is a danger to peace. 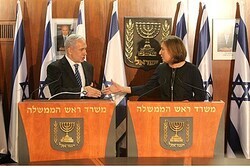 Yes, the lady has a price, and Bibi met it. Since Naftali Bennett, who aligned himself with Yair Lapid, after campaigning that he will be a valuable member of Netanyhu's coalition/cabinet only succeeded in alienating himself further. He thought that Bibi would be so desperate for his MK's to add to the coalition that the PM would come begging, but no surprise the political newbie miscalculated. Bennett shouldn't have trying to play chicken against a pro. And no doubt that Yair Lapid sees his future with Netanyahu in the cabinet! He's not going to stick with Bennett. It really doesn't matter that this Netanyahu-Livni coalition agreement goes 100% against both their campaign promises, statements etc. This is politics, and politics is a search, striving for power and politicians will do and say anything to get it. During the election campaign, Netanyahu had reportedly made clear to several of his senior staff that no talks were taking place with Livni or other members of her party, and that the chances of her joining the next government with him as Prime Minister were nil. So, it's time to get comfortable and watch Bibi's show. Some Truth About the IDF, Religious and Secular Leftist Soldiers etc. I'm going to start by suggesting you read Our Shiputzim's fact-filled post about religious life (aka Orthodox Judaism) in the IDF-Israeli Defense Forces. 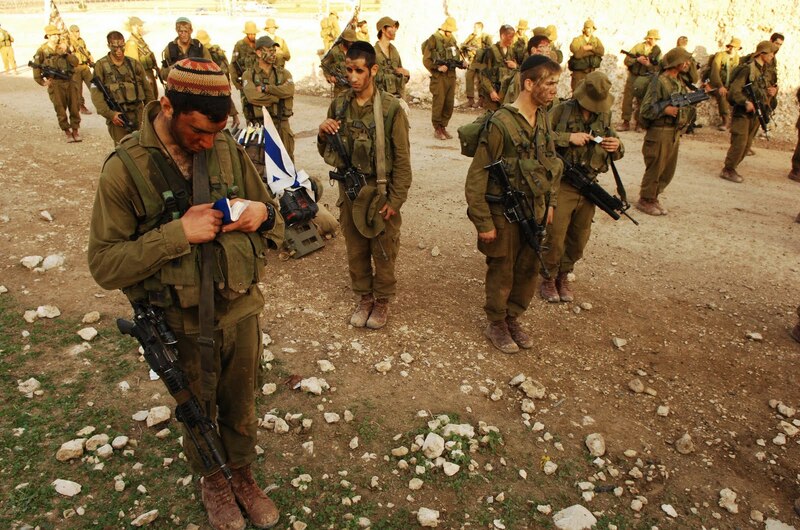 MYTH: The IDF has it in for religious soldiers. 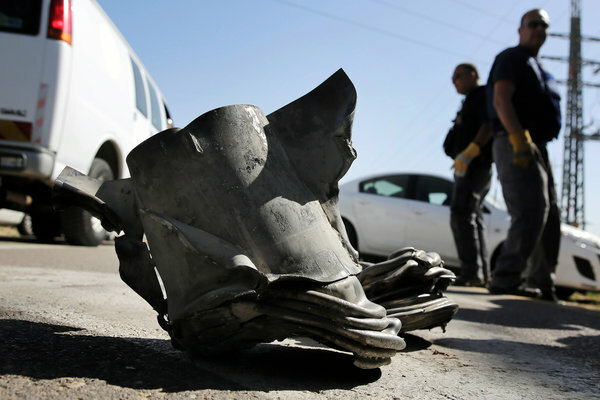 Our Shiputzim continues the post with a list of true stories from the IDF of today. I stress that it's today's IDF and not even the time that my sons served. Real change comes slowly, and even if the Knesset passes a law to draft everyone, it will take quite a while for this to be useful and efficient and the best for Israeli security and social needs. Even thirty years ago, when I was the English Public Relations for Yeshivat Hesder Shiloh, our soldiers were being assigned to the Tzanchanim, Paratroopers. The IDF's bottom line has always been practical, and practical means talking advantage of the most dedicated and motivated soldiers to give them the most challenging and difficult army positions. Yes, there has always been a concept of חייב לעבור chayav la'avor, "must pass," aka protexia, that sons or grandsons of certain people have an easier time getting into some units, but push comes to shove and those same units are sociologically very different today than they had been ten, twenty and certainly more than a generation ago. The children, grandchildren and great-grandchildren of Israel's Leftist secular "elite" now request desk jobs, not to be in the risky paratroopers or Prime Minister Binyamin Netanyahu's Sayeret Matkal. The General Staff Elite ('Sayeret Matkal') is considered the best combat unit in the IDF, and one of the best Special Forces units in the world; a unit where the word 'professionalism' represents a way of life. The warriors of the unit are selected with the utmost care, through rigorous tests and physical trials. The warriors specialize in commando operations and scouting (-including navigation and operation of a vast range of vehicles). In this unit, the most technologically advanced equipment that the IDF has at its disposal is put to use. The unit even has certain equipment that it alone uses. Those troops, which were once a bastion of Israeli secularism now also have a large percentage of soldiers from religious families. The IDF reflects Israeli society, and just like when we first made aliyah, came to live in Israel, over forty years ago we rarely saw obviously religious bus drivers and policemen, now not only do we see lots of dati le'uimi, national religious men, and even women sometimes, in those sorts of jobs, you can also see those who appear chareidi. Yes, again I must say that Israel has changed and army, IDF, is pragmatic. Those in charge may not have always expected to see strongly religious soldiers in certain positions and they certainly didn't expect so many soldiers to take time off to pray and insist on strictly kosher food and a succa on Succot, but they are pragmatic. They know that they must have the most sincere and dedicated and patriotic in critical positions and units. It may have made for good "campaign promises" when party leaders like newbies Yair Lapid and Naftali Bennett promised change in the army and immediate forced draft of chareidim (in Lapid's case,) but forcing someone to be a soldier isn't good for the army. It doesn't matter if he's extremely religious or extremely Leftist, the results are bad for the security of the country. ... forcing someone to be a soldier isn't good for the army. It doesn't matter if he's extremely religious or extremely Leftist, the results are bad for the security of the country. That's the bottom line. The IDF is changing with the socio-religious composition of the army,of its soldiers, and that's the way it should be. But in all honesty, Netanyahu may be busy with a new election campaign when Obama is scheduled to visit. He can't form a government coalition without NRP aka Bayit Yehudi and Yair Lapid's Yesh Atid. The numbers don't work well without those two "large" parties. The bad blood between Netanyahu and NRP's Bennett and his long time sidekick Ayelet Shaked seems to be a lot worse than anything I had originally imagined. The foreplay is getting dangerous. As wily and experienced a politician as PM Netanyahu is, I wonder if he can break the Bennett-Lapid alliance well enough to get them to work for him. According to NRP aka Bayit Yehudi's campaign, you'd think that Likud-Beitenu would be the best political partner and not more Left-secular Yesh Atid, but Bennett has been playing us for suckers. OK, maybe not me, since I didn't vote for him. Lots of people voted for NRP because his party had strong pro-Jewish life in the Land of Israel candidates for Knesset. They expected it to be like "Otzmah-lite." They and Likud kept harping on the "certainty" that Otzmah LeYisrael wouldn't make get the minimal votes needed, which became a self-fulfilling prophesy. Now we just have a "lame duck" government waiting to be replaced. Whose fault is it? Does Bennett think he'll get more seats if elections are held soon? Or will people be fed up with this egotistical brinkmanship? In this game, someone has to blink first. On the one hand, Prime Minister Benjamin Netanyahu's associates say Likud-Beytenu will not agree to exclude ultra-Orthodox parties in the next coalition while inviting control of the next government by Habayit Hayehudi leader Naftali Bennett and Yesh Atid head Yair Lapid. Netanyahu's associates say he would rather call for new elections than answer to Bennett's obstinacy to stand by Lapid in his demand to exclude the haredim. On the other hand, Bennett's associates say that he will never break his alliance with Lapid, even if that means toppling Netanyahu. In order to prevent going to elections again if a government cannot be formed, someone needs to fold. The big question now is who. I still think that the Israeli Government should have told the American one to freeze the idea of a visit until after coalition negotiations were completed successfully. A couple of years ago I studied Megillat Esther in a year's course at Matan by Atara Snowbell. When we began, nobody thought that such a small "book" could take a year to study, even in depth. But the truth is that we could have continued at least another few months. There's a lot to it. In Biblical times, communication took a very long time, and it was very easy to deceive and keep secrets. That's one of the reasons Haman had such an easy time deceiving King Achashverosh. Nowadays, with telephones, internet etc, communication is so quick, even over distances. Havel Havelim, taken from King Solomon's Kohelet, Ecclesiastes, is a term that can be translated as norishkeit, is the Jewish and Israeli blog carnival, internet magazine/collection, of blog posts. It was established by Soccer Dad who no longer blogs, and in recent years, we've been using a facebook page to keep it going. Jewish and Israeli bloggers are invited to participate by sending in posts of the preceding week to the volunteer host. Information can be found on our facebook page and the previous HH edition. I requested that bloggers send in two posts, one of their own and one from another blog. Some bloggers did this, and others just sent their own posts. Havel Havelim is a wonderful tool/medium for Jewish bloggers all over the world and of all different opinions to get together. Please share HH and the various posts and comment, too, of course. If there's one person/blog who can be credited with keeping Havel Havelim going the past few years, it's Esser Agaroth. Here are a few of his recent posts, Elazar Stern, Oy! a food for thought post about the possible effects of more religious Jews in the IDF and another "Oy!" this one about Yesh Atid. Havel Havelim isn't the only Jewish blog carnival. There is also the Kosher Cooking Carnival, which comes out every Rosh Chodesh, the beginning of the Jewish Month. 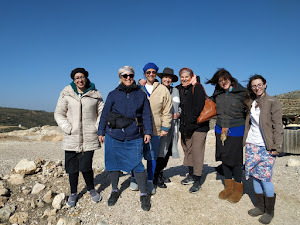 The Adar edition is hosted by Adventures in Mamaland, who posted it as she and her husband got on the plane for their pilot trip, לתור את הארץ lature et ha'Aretz to scout out the Land. I even got to see them in person f2f! Here's some mostly good news from Ima2seven. She recommended that I include a post from All Victories, which is a blog I'd never read before. For Posterity is an amazing post. Read it, please. Cooking Outside the Box sent a Purim Recipe. Here's a very "only in Israel" story about soup and more from A Soldier's Mother. For many people, this is the last week to eat last Passover's matzah, if you still, like us, have some stored on a high shelf some place. My simple Matzah Brei recipe is good for now and it's even better on Passover, and if you're among those who don't eat matzah brei during Passover, then save some matzah and make it afterwards. Real Jerusalem Streets is a picture blog. This week had three posts, 10 Signs of Purim, The Book Fair and A Secret Spot in Jerusalem. Purim isn't just about fancy costumes and noisy parties. The Shabbat before Purim we read a special Maftir, Torah Portion which reminds us to remember what Amalek did to us. For many of us, it is almost too easy to remember. Some of us are survivors of Arab terror attacks and/or lost friends and/or family or have to cope with serious injuries because of Arab terrorism. Read this lovely story, with a message from Yocheved and also her reminder that it's hug time. Bat Aliyah's post is one to make you think, Ontogeny Recapitulates Phylogeny. Thinking Torah gives us a review of Siddur Nehalel beShabbat , which looks very interesting. And he also posted a Puzzle for Parshat Trumah. Another blog I'm not familiar with was recommended by Esser Agaroth, The Heart of Adam, which has a post about two Biblical artists, or artisans, Betzalel and Oholiav. There aren't too many multi-generation blogging families. My friend Ruti and one of her sons are in that exclusive category. Ruti's title, You're Somebody's Type made me expect something else. It's must read for sure! Ruti and her husband, Coach, have lots of sons, so now they are adding daughters-in-law to the family. I met the latest, who's a doll. I recommend Ruti's advice on making Shabbat on a Budget. And her son's blog, In Their Dusty Footsteps isn't afraid to touch on controversial topics, Homosexuality: Faith vs. Logic . 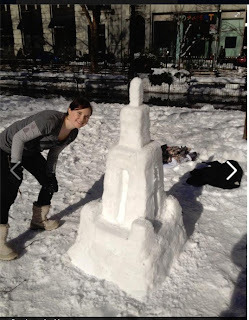 Marina's Letters From Israel has a beautiful post showing pictures of Israeli beaches in the winter. She also sent me a very important post from Mother in Israel, Fighting City Hall about getting help for special needs kids. Here's Jacob's Hebrew-English Purim Vocabulary. I've made it a custom on Rosh Chodesh to pray at Tel Shiloh, where the Biblical Tabernacle had stood as a center of Jewish Prayer for 369 years. One of my friends gives us a special tour every month. If you'd like to join our women's prayers, please contact me. We pray as individuals and sing Hallel together. Have a wonderful week. Enjoy Purim in good health. Please visit all the blog posts, comment and share. The best political parody on internet can be found on Latma. They deal with Israeli and international topics. Latma's Tribal Update presents a behind the scenes look at how Obama's national security team decided to send him to Israel. We also feature an interview with EU representative Johann Phlegmat discussing the EU's Hezbollah problem, and take an in-depth look at the allegations of pedophilia in Modiin Illit. Latma is funded by donations to the David Horowitz Freedom Center's Israel Security Project which I direct. If you would like to contribute to our work, which is funded entirely by viewer contributions, please go to this link. It's a project of Caroline Glick. I was run over by an Arab terrorist just before Shabbat Zachor, "Remember what Amalek did to you," seventeen years ago. "Zachor Et Asher Asa Lecha Amalek BaDerech Betzetchem MiMitzrayim"
"Remember what Amalek did to you on your way out of Egypt! (Dvarim 25)"
On the Shabbat that precedes Purim, two Torah scrolls are taken from the ark; one for the regular parsha and one for the Maftir - 'Remember what Amalek did to you' (Dvarim 25). Because of this reading, it is called, Shabbat Zachor (Remember). The Haftorah also deals with Amalek. There is a mitzvah in the Torah to remember Amalek and his descendants and to orally recall their iniquity. We are to tell our children in each generation what the people of Amalek did to us during our departure from Egypt. This mitzvah will be fulfilled completely only when we shall have caused Amalek's memory to perish, and their name to be erased from the world, together with the slightest remnant of anything that bears their name. As the Torah says: 'Remember what Amalek did to you on the way, upon your departure from Egypt'... 'You shall erase the memory of Amalek from beneath the heavens, you shall not forget.' Upon which the Sages have expounded: 'Remember,' orally - 'You shall not forget,' in your heart. On Shabbat, few days after the terror attack, I limped to our synagogue, made the blessing, ברכת הגומל Bircat HaGomel to thank G-d for rescuing from a dangerous situation and also heard the special pre-Purim Maftir: Zachor! "They wanted to destroy us. They attacked. We won. So let's eat!" Until I was a victim of Arab terrorism it seemed more "something that only happens to others." Even though it had happened at a time when there were many Arab terror attacks, most common were the suicide bus bombers, I did not go around thinking that "my time would be soon," or that there would be a "my time" at all. I'm not really paranoid. I'm just an ordinary relatively pragmatic person. Unexpectedly, the attack, and my minor injury did not increase my personal fear and worry. I actually felt calmer about my personal safety. Being a victim of such an attack reinforced the knowledge that I have no control. The Arab terrorists control the actual time and place and G-d controls the results, whether we live, die, suffer permanent or minor injuries. And we must somehow try to find a way to understand what to do with this dangerous and unpleasant experience. I'm just an ordinary person, but I wasn't attacked as an individual. There was nothing personal about the Arab terror attack. Some of the Jewish victims of Arab terrorism have been Leftists who, if it had been up to them, would give everything they could to Arabs in the hope that it would "end the conflict," sic. One of the lessons of Amalek's hatred of Jews is taken from the fact that Amalek went after the weak, the innocent civilians. The weak aren't a threat to them, but since they are easy targets, they get targeted. That's true terrorism. Modern terrorists base themselves on Biblical Amalek. That's why we must remember Amalek and "what Amalek did to you on your way out of Egypt!" As is my longtime custom, I went to שילה הקדומה Shiloh HaKeduma, Tel Shiloh to pray on Rosh Chodesh Adar. Considering the problems Prime Minister Binyamin Netanyahu is having constructing/negotiating his latest coalition, maybe he should go to Tel Shiloh, site of the Mishkan, Tabernacle to pray, too. Biblical Chana prayed in Shiloh for a son who would be the national and spiritual leader of the Jewish People to establish monarchy. So, considering the state of our nation today, Shiloh is the perfect location for prayers. The Jewish Month of Adar is known as a time of change, reversals, bad to good, winter to spring. Yes, I was amazed at how richly the trees were in bloom and how beautifully the wildflowers had begun to cover the ground. Last month, Rosh Chodesh Shvat, we saw green and brown, but now we also see red, pink and white. Shiloh has been the location for prayer since Joshua made it the capital of the Jewish Nation after the Exodus from Egypt. The Mishkan, Tabernacle, which had been a mobile synagogue during the forty years we wandered the desert, was set up in Shiloh and stayed there for 369 years. That location, a large flat area to the north is now being excavated by archaeologists. Wherever you look you can see signs of ancient building and construction. Stones don't naturally look like these. Next Rosh Chodesh is Nissan. Women are invited to join us for Women's Rosh Chodesh Prayers. And don't forget that the Tel Shiloh, aka Shiloh HaKedumah is open for visitors six days a week. For information call 02-994-4019. In Israel we had elections a few weeks ago, January 22. It was just before my two week trip to the states, and I've been back a week. And it doesn't yet seem like Prime Minister Binyamin Netanyahu has been able to put together a government coalition. During the election campaign, I blogged a lot about the difference between a coalition party and and opposition party. Netanyahu understands the differences very well, IMHO almost too well. Inflexible "principles" are for the opposition only, not the coalition. There's a moral/ideological price to pay for that "Volvo*." Netanyahu isn't new to coalition politics. It's his third big attempt, and he succeeded pretty easily the two previous times, even after the elections when Likud did not get the most Knesset votes. But this time, he has to contend with political newbies, Yair Lapid and Naftali Bennett who are taking their campaign promises and alleged agreement with each other much more seriously than the more jaded and experienced politicians would. Leaks from Likud reveal that NRP-Bayit Yehudi's Bennett had been offered some very good positions for his people, but he isn't biting alone. Likud Beytenu offered Bayit Yehudi the Education Ministry, a top socioeconomic portfolio, and a deputy defense minister who would deal with settlements, Likud sources said on Tuesday. A Likud source said the offer was conditioned on Bayit Yehudi conducting marathon coalition talks over 48 hours to become the first party to join the coalition. The media keeps saying that he and Yair Lapid of Yesh Atid's have made a deal to pressure Bibi by sticking to the same basic government conditions/principles. Lapid is sticking to what could be a socially, spiritually and military upheaval in the IDF, almost 100% draft of chareidim. Yesh Atid wanted to set the age of enlistment for haredim at 18, as in the rest of the general population, and allow exemptions for only 400 exemplary yeshiva students every year. In the first five years, however, Lapid imagined offering full exemptions to ultra-Orthodox students who requested them, introducing a gradual increase in ultra-Orthodox conscription. This may have sounded good when asking secular Leftists for their votes, but many of those voters don't really want their children to be influenced by extremely observant Torah loyal Jews. Esser Agaroth has an interesting post about that. That's what this all boils down to. We're really fighting for the soul of the Jewish People, especially those in Israel, not for Volvos. Nu, will the wily Netanyahu succeed in crafting a new coalition before his deadline, or not? ﻿﻿﻿﻿﻿﻿*A Volvo was once the make of cars used by Israeli Government Ministers. All ministers and sgan, assistant/vice ministers are provided with chauffeured limousines, cars plus drivers as perks of power. So, referring to the "Volvo" is to refer to those perks. United States President Barack Hussein Obama no longer has to please the American People. He is in his second term, and unless there's a quick change in the American Constitution, it's his last term as POTUS. It looks like he's up and running to do everything he can for his Arab friends and pet terror state, aka the PA, Palestinian Authority. -The President's first Presidential visit. In a major speech from Cairo, he reached out to the Moslem world. -Arab Spring riots and protests begin,sweeping from Tunisia,through Egypt, Libya, Yemen, Bahrain, hitting Iraq, Jordan, Kuwait, Morocco, Sudan, Lebanon, and Syria. Obama's new Secretary of State John Kerry has made aiding the Pseudostinians aka Palestinians sic his priority. Remember you must judge people by their friends. But I think the question of whether or not he is actually a Muslim or just an Islamophile is just as unimportant as his hippy days learning to love Islam. And by the same token, I think that it is unimportant if Obama is or isn't a Muslim. I don't care whom they pray to. The question is whether their world view, and their policies would be any different if they were Muslims. And I think the answer to that is no. And since it is their policies, not their beliefs that matter to the world, they should be judged for that. Aside from his hippy past, and his horrible, obsequious Arabic, the thing that made me most uncomfortable about Brennan's whole paean to Islam is the fact that he said "Palestine" twice and never said Israel, and when he finally felt compelled to say Jerusalem, after saying "Al Quds" twice he sounded like he was either going to spit or apologize for mentioning the word Jerusalem in the presence of his audience. So does it matter if this man is a Muslim or not? Not in the least. He's just as dangerous either way. I trust Glick, not Obama for sure. Another important point about the Arabs who are terrorizing Israel can be found on Israel Matzav. They, especially the terrorist organization Hamas has plenty of money, but they don't use it to help their Arabs. There's an interesting article in the Jewish Press by Joe Settler which hinges on the concept of "Moral Authority." When a drafter of Israel's Constitution says there is a problem because too many IDF commanders are religious, we need to worry about what kind of Constitution he is drafting. 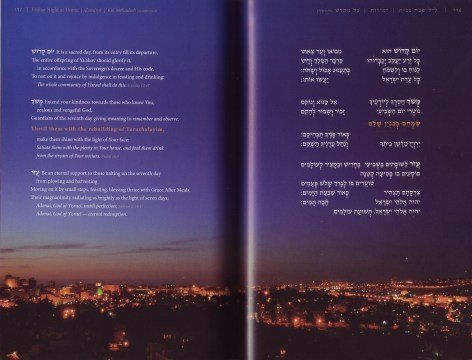 For many years, I've been troubled by the fact that even Torah observant (aka Orthodox) Rabbis, especially American Yeshiva University educated ones, such as Rabbi Shlomo Riskin and Rabbi Aaron Lichtenstein, have somehow added non-Jewish concepts/ideologies of Liberalism and Democracy to the 613 mitzvot, Torah commandments. We Jews have a much more veteran and well documented social and political philosophy/ideology in our Torah and Talmud. It actually contradicts many modern "moral" philosophies/ideologies, because it's timeless. I was especially disturbed in the troubling times leading to the Disengagement expulsions when so-called Torah observant rabbis said that a Knesset vote could over-ride the Jewish connection to the Land of Israel and even banish Jews from their homes, communities and businesses. ישוב הארץ Yishuv Ha'Aretz, the Settling of the Land is a cornerstone of Judaism, and a large portion of the Torah is centered on it. The Torah is our MORAL AUTHORITY. Without it, we Jews couldn't have had survived as a People during the thousands of years of exile from our Holy Land. Our Land and our Torah are what has kept us a people. Last night, I was at a shiur by Inbal Amiton – “Believe and plant: The Redemption of Land as a Reflection of the Redemption of the Nation, According to Yirmiyahu 32” in Matan. Amiton said that according to Yirmiyahu (Jeremiah,) first G-d will return us to the Land and then we will do Teshuva, repent. I see the process of Torah observant Jews growing in the IDF (Israeli Army) as proof that it is happening today. Israel's secular and quasi-secular/religious leaders don't understand that our true Moral Authority is G-d given. No doubt the betters are taking bets on how long Prime Minister Binyamin Netanyahu's next coalition will last; that is if he actually succeeds in forming one. The fact that he must make a deal with political newbie Yair Lapid, who isn't experienced and jaded enough to understand that compromise is the name of the game, is making things difficult. His supporters want him as Foreign Minister, because they think of it as a social photo-op position, just perfect for the media star. Powerful political positions require more than a good haircut and dentist. Netanyahu has stayed in power (and returned to it after his loss) because of his intelligence and growing political savvy. Even if he strikes out this time, I wouldn't consider him finished, out of the game. “Anyone who thinks that in the center of the diplomatic, political and social tsunami that is shaking the Arab world it is possible to get a magical solution of comprehensive peace with the Palestinians does not understand,” he said. I certainly prefer him as Foreign Minister over the other candidates/wannabes, especially Lapid. Lapid isn't Netanyahu's only problem. Shas and its Rabbi Ovadia Yosef don't want to play ball with Lapid. During his weekly Torah lesson, Rabbi Yosef said Lapid “hates yeshivas” and said he is “contemptible”. Lapid has demanded that hareidi yeshiva students be drafted into the army as a condition for his entering the coalition. The only way that Bibi can fashion another government coalition is if Shas and Lapid will agree to sit together. From what I've read, NRP-Jewish Home's Naftali Bennett understands that simple fact of life. If you're too fussy, you may lose it all. Can Israel afford new elections so soon? Jewish Marriage, Isn't The Ketubah a "Prenup?"